One of the great things about IKEA is the broad appeal of its furnishings. With understated styling, reasonable prices, and adequate quality, the Swedish-based megastore is the perfect place to find sofas for recent college graduates, dishes for newlyweds, and work desks for telecommuters. And also, as clever Japanese pet owners have learned, adorable beds for cats. Officially, IKEA hasn’t moved into the pet supply sector. 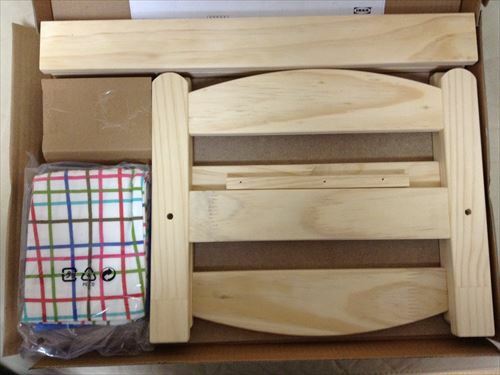 The compact, 2,299-yen (US$20) Duktig is actually supposed to be used as a “bed” for children’s dolls. Since it’s technically a toy, assembly is incredibly simple, consisting of inserting four pegs and four screws before slapping on a board. Still, it seems like kind of a waste to buy creature comforts for inanimate objects like dolls. So instead, savvy Japanese pet owners have been picking up Duktigs for their cats. The Duktig comes bundled with a tiny little sheet, but most pet owners who’re dedicated enough to buy furniture for their kitties seem to spruce the bed up with some extra linens and blankets. ▼ We wonder, since they’re already covered in hair, do cats appreciate a fuzzy blanket as much as we humans do? Even though it wasn’t created with cats in mind, the bed turns out to have one very feline-friendly design point. Since there’s a gap in the edge of the frame where a person’s toes would be, the cats have a perfectly placed opening to stick their tails through. Much like with human beings, the cats’ reactions upon being woken up seem to range from startled to stink eye. On the other hand, leave them alone, and they loo cozy enough to sleep all day. Of course, a lot of cat lovers have multiple kitties in their homes, which of course require multiple beds. If floor space is at a premium, though, drilling a couple of holes is about all you need to do to make a bunk bed. Really, you can never underestimate the power of a good night’s sleep in improving your mood. A solid 40 winks is enough to make even natural enemies get along, as this photo proves. 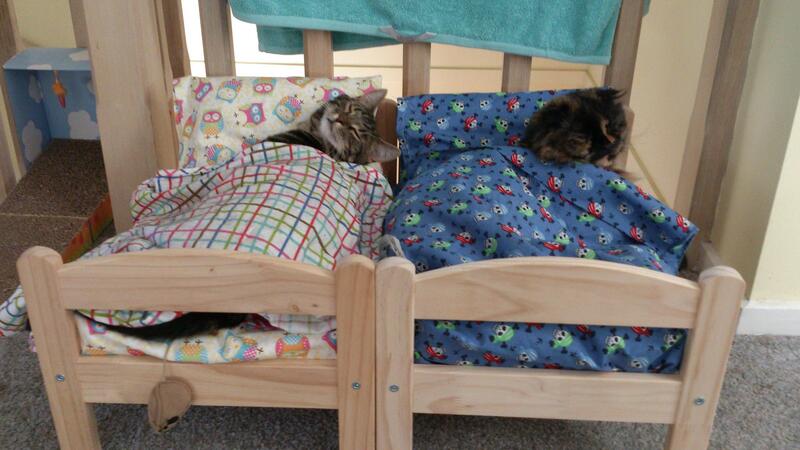 Hmm…why are we not surprised the cat snagged the top bunk? Great idea for kitty beds! Cute too!